Basically, PC considers each pitch as a decision that the batter must make. When the batter makes a "correct" decision, he will swing and hit a pitch into play (the outcome is ignored; also, two-strike fouls are considered correct responses), or he will take a pitch that is a ball. But there are two ways a batter can make an incorrect decision. First, he can swing and miss (or foul, if less than two strikes) a ball that he thought he could hit (a false positive--note, this could still be a ball in the strike zone--PC can't discern that with his dataset). Or, he can take a strike that he thought would be a ball (a false negative). Once he does this, PC reports two statistics. First, he reports "sensitivity," which is an indication of how often the batter makes the right decisions vs. the wrong decisions as defined above. The highest sensitivities top 1.00, while the lowest are around 0.2 or 0.3. Adam Dunn, in 2006, had a sensitivity of 0.48, which ranked him 404th out of 431 batters. This means that Dunn makes far more mistakes than correct choices in terms of how he responds to pitches. The second statistic that PC reports is "response bias." This essentially tells you the direction in which a batter makes mistakes. High biases (over 1.00) indicate batters that tend to swing and miss a lot more than they take strikes. Low biases (below 1.00) indicate batters that tend to take a lot more strikes than they swing and miss. Adam Dunn's response bias was a fairly low 0.918. This indicates that he takes a lot more strikes than he swings and misses. The overall view of Adam Dunn, therefore, is that of a hitter that makes a lot of mistakes with regards to when he should swing, usually because he's taking pitches that he "should be" swinging at. This is very consistent with most scouting reports on him, of course, but this is the first time that I've seen statistics that can really demonstrate this. Whether you view Dunn as being very disciplined, or as being very reluctant to swing, is probably up to your definition of discipline. To me, it might indicate great patience (perhaps to a fault), but probably not good discipline. Scott Hatteberg makes a very interesting contrast to Dunn. As you'll recall, Hatteberg's walk rate was second (at 14%) on the Reds last season to Dunn's (17%), yet his strikeout rate was the best on the team (just 8%). The net run value from Hatteberg's strike zone judgement (walks and strikeouts) was about four runs greater than Dunn's. So how does Hatteberg shake down in this new analysis? his sensitivity was a remarkable 0.97, the 7th best in baseball. Therefore, Hatteberg made very few mistakes. When he swung at a pitch, he usually made contact and hit it fair, but when he took a pitch, it was more likely to be a ball than most other hitters in baseball. Update: Pizza Cutter has kindly posted his data in a google spreadsheet! Thanks! I'm looking forward to giving these data a look...once I get caught up on all the month-change events around here. You nailed it. Dunn's patience is patience to a fault. He will take more balls, but he 'buys' them by taking an even greater proportion of strikes than he gains in balls. Previous seasons are easy enough to do. I'd just need the appropriate Retrosheet file from a year that there is pitch by pitch data available. I'd also be happy to get them into a spreadsheet format. Thanks--I'm glad to hear that I'm interpreting your work properly. The thing that I always find interesting about Dunn that the net effect of Dunn's "strategy" (maybe "tendencies" is a better word?) with regard to pitch selection is positive for the team. He produces more runs via his walks than he costs the team via his strikeouts, at least according to Dave Studeman's runs data in the THT 2007 Annual. Here's a figure I whipped up earlier in the year. Certainly there are different ways to be a hitter (Vladimir in your study is a rather extreme example of a successful strategy, at least for him). But one has to wonder whether the sort of false-negative bias employed by Dunn might be a good strategy, particularly if you're a player that is not good at making ball/strike decisions. Great interpretation. I think I finally get it!!! Response bias of 1 means that the hitter had as many swinging strikes as called strikes. Also a player that makes only 1 wrong decision should have a high response bias in favor of whichever way he made the wrong decision. John, one minor correction. It's not that a response bias of 1.0 means that a hitter has equal raw numbers of called vs. swinging strikes. League-wide, the ratio is about 2:1 swinging to called, but the math I employ corrects for that. 1.0 means that he doesn't swing so much that he incurs too many swinging strikes or that he doesn't take so much that he incurs too many called strikes. 1.0 means that he is minimizing strikes, given his abilities. J, when I was talking to Phil Birnbaum (editor of BTN), he brought up the issue of whether it even matters. Vlad clearly swings too much, and I don't see the Angels in any hurry to get rid of him. One of the conclusions that I came to in my head after doing this study is that perhaps plate discipline, while it exists and can be measured, doesn't matter all that much. Food for thought. I have a feeling that there are different hitter types, and that different types of hitters might have different optima. For example, do hitters with low sensitivity tend to be more productive if they have a high bias or low bias? Might be cool to look at a plot and see where successful hitters tend to group. Obviously Vladimir's approach is hugely successful for him. Hatteberg's pretty successful too at the other end of the spectrum (at least in 2006). But are there successful hitters with low sensitivity, and do they tend to be biased one way or another? Brad Wilkerson tends to get on base a lot (and had horrible sensitivity last year), so I might predict that he'd have a low bias as well...? Interesting stuff. I can think of a couple of biases that are somewhat inherent in the study. For one thing, not swinging at a pitch that, while it may be a strike, is not in your hit zone (or fouling off such a pitch) is not necessarily a "mistake" but often good judgment. At least, until you get to two strikes, when you want to foul those close pitches off. Another is regarding fouling a pitch off as a "mistake," while hitting one, even as a weak infield roller, is judged as "good." I would contend that the reverse is often true. I think these are biases in the data, although without looking I would estimate they would probably be small. Still, I don't know how small, and they could be significant. 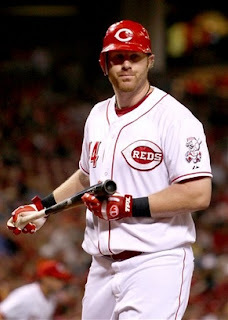 And it tells us something we knew, that Adam Dunn really should swing the bat more. We knew that because of the high number of called third strikes he takes. Justin, something you said sparked me to play around a bit with the data. I had to use the 1998 data set (for some technical reasons on my part) to do this, but there's a way to empirically group people together called cluster analysis. I used it to create groups of players who are most similar to one another. I came up with five groups, guys with high sensitivity who are free swingers, high sensitivity low-swingers, high sensitivity guys with response biases around 1.0, and then two groups with response biases around 1.0, but who are medium and poor in sensitivity. From the looks of it, high sensitivity hitters tend to be rather variable in their response bias. I generated a simple scatterplot of the two measures and sure enough, it made something of a megaphone shape. Some interesting trends going on here. Not sure what it all means, but I need to go to bed. I've seen a number of posts linking to this post from other forums lately that are using this information to argue that Dunn is a bad player. I think one of the things that is most interesting about Dunn is that even though he makes a lot of "mistakes," (as defined in this analysis) he still manages to be extremely productive at the plate. His strategy, which involves a reluctance to swing, has the net effect of getting him on base a lot. And his walks more than make up for his strikeouts, in terms of runs contributed to the Reds' offense. ... And that's before we consider his tremendous power. Trade him, or let him walk? The amateur draft is approaching!